Makayla Camilletti (18) works on her foul shots while teammate Lisa Camilletti rebounds and head coach Matt Ray watches at a team open gym last week. 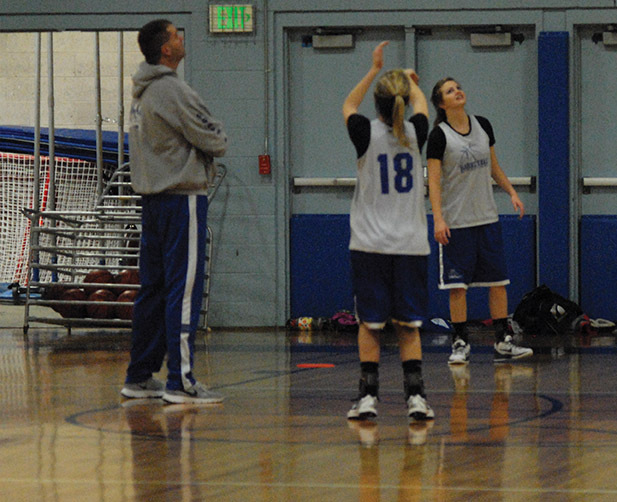 The Moffat County girls basketball team focused on shooting during winter break to help its offensive output. After a 1-2 start, the Moffat County girls basketball team won three of four games to turn its record positive before winter break. In an even better turn for the team, Roaring Fork lost two games before break, putting the Bulldogs in the driver’s seat in the Western Slope League. Now head coach Matt Ray wants to solidify that position. Ray and the Bulldogs basketball team got together Friday and Saturday for open gyms. After a strong finish to 2012, Moffat County took time off during break in accordance Colorado High School Activities Association rules. The time away from the hardwood can make coaches nervous, but Ray recognizes how valuable time away from the game can be. Despite being 4-3 and leading the 3A WSL, the Bulldogs have not played their basketball this season. During the open gyms, Ray had the team work on one aspect of the game: shooting. Moffat County’s offense has struggled at times this season, so Ray hopes repetition of shooting will help the Bulldogs hit more shots, especially from behind the three-point line. Aside from improving their shooting form, the open gyms and practices over break will help the Bulldogs stay in a basketball state of mind.